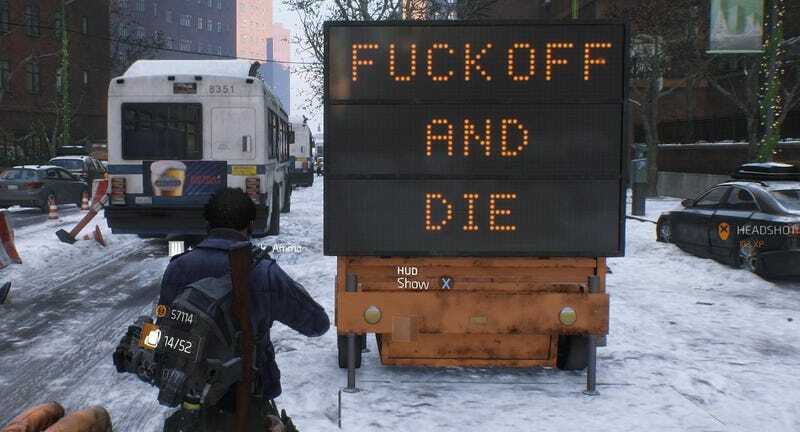 In Tom Clancy’s The Division, there’s a war on the streets. There’s a war on the message boards and in the forums, too. This game is having a tough time all around. The real-world forum war centers around bugs, changes to the endgame economy, and a handful of exploits found in the new endgame “Incursion” mission. They’re coming in the aftermath of the game’s first major, free post-release update, which hit last week. It changed how the endgame worked and added the first and unfortunately disappointing Incursion co-op mission. Called “Falcon Lost,” the Incursion was billed as a raid-like mission intended for squads of max-level players. It would challenge the most powerful players; beating it would require teamwork and tactical play and would reward players with the most powerful gear in the game. As it turns out, Falcon Lost is basically just a 15-wave horde mode constrained to a single room. It requires a team to fight off a bunch of bullet sponge dudes, then repeat the same tactic a few times to blow up a stationary armored vehicle. If the team gets wiped out at any point, they have to start over again from the beginning. Whee. The Incursion was disappointing enough, given that lots of players were expecting something more in line with what year-one Destiny players got in the phenomenal Vault of Glass Raid shortly after that game’s launch. Even more frustrating, though, was the discovery that Falcon Lost could be easily exploited, which meant that dedicated cheesers could use it to churn out full loadouts of the best gear in the game. Ubisoft Massive issued a hotfix on Friday to address one of the most popular exploits, along with the bug that had caused some Xbox One players’ characters to vanish. Of course, players quickly discovered new ways of getting “outside” the mission, which lets you blow up the target vehicle without having to actually fight through the waves. Like with many loot-centric online games, there’ve been various farming exploits and cheeses in The Division since it launched. (I sure farmed The Bullet King for a few afternoons.) The difference here is that Falcon Lost is by far the most consistent way to acquire the best new gear in the game, meaning that exploiters have quickly put themselves so far beyond legit players that for the time being, the latter group must either do the exploit or resign themselves to being underpowered. The imbalance would be frustrating in a mainly PvE game, but it becomes a real problem in The Division’s Dark Zone. The Dark Zone is the rough-and-tumble area in the middle of the map where players can go to fight tough bosses and also take on squads of other players. A person who spent a day exploiting Falcon Lost can roll into the Dark Zone with such powerful guns and armor that they’re nearly invincible to legit players. It’s pretty easy to tell who’s been running the exploit, too. After the update, players now have a “Gear Score” next to their name, similar to gear levels in other MMOs or light levels in Destiny. The highest possible score for a piece of gear is 240. Given how difficult it is to get GS 200+ items, if a player already has multiple pieces of 240 gear this quickly, something’s up. Gear Score has also devalued previously exciting gold High-End (HE) gear, since the majority of HE gear drops with a gear score in the 160-190 range. I was pretty happy with the HE First Wave M1A that dropped for me during a challenge mission a few weeks back, but it turns out its gear score is only 182. My prized gun went from good to lackluster in a single update. Standard stuff for a level-cap increase, but a bitter pill mere weeks after I got the thing. It could be that Ubisoft Massive will fix further exploits and roll back cheaters, issuing temporary bans and taking away their ill-gotten gear. They could also go one further and get rid of the mobile cover ability, which can be used to wall-glitch through many of the barriers in the game and thus has been used in many of the most popular exploits and world-hacks. Even if they do all that, the fact will remain that the Incursion is a dull slog when played properly. It doesn’t come close to the sort of fast-thinking, high-level tactical challenge many of us hoped for when we first started playing The Division last month. According to reports from players, plenty of other problems would also remain: cheaters who teleport their way through the Dark Zone, numerous bugs and connectivity issues, disappointing loot drops and the fact that it takes an age and a half to get enough materials to craft anything. There’s also a familiar feeling that there just isn’t enough to do. I’ve been playing very casually over the last few weeks and even I feel like I’m repeating the same missions over and over. I can only clear the same challenge missions so many times, and the beautiful non-Dark Zone open world offers little but underpowered enemies and weak loot. The people having the most fun right now are probably brand-new or slow-paced players who haven’t hit the level cap and are still working through the story campaign. The short-term balance problems could be addressed in a number of ways, and there’s plenty of time for Ubisoft Massive to get the endgame sorted via subsequent updates and, eventually, paid expansions. That’s all in the future, though. For now, The Division is in a rough spot. Update 4/20/2016: A number of new exploits have surfaced since this article’s publication, including a bug that lets players briefly do ridiculously inflated damage as well as a simple PC hack that allows players access to an endless stream of high-end crafting materials. Natchai Stappers, the Ubisoft community manager quoted above in this article, today elaborated somewhat on Massive’s approach to dealing with exploits and bugs. “I understand you’re all frustrated with it,” he wrote of the cheating, “but do understand that we are actively dealing with cheaters, we are banning them, permanently as well, but because so far it’s been a decision not to communicate on numbers and the likes, this has gone largely unnoticed and makes it seem like we’re not doing anything.” Ubisoft PR has yet to respond to our requests for comment and clarification.